1421: Voyages of Zheng He is one of IGT’s more original and creative Chinese themed slots. Yes, we know that IGT has kind of been churning these out of late; but unlike many other Chinese-themed slots from this developer (and others), the 1421: Voyages of Zheng He slot has style, it has decent graphics, and it has a decent theme – believe it or not. 1421: Voyages of Zheng isn’t your usual dragons, lanterns and firecrackers themed slot. This is a slot machine which is about a man (Zheng He), who sailed the seas of China in the fifteenth century, discovering new lands and having merry adventures. No other slot has decided to make Zheng He the focus of their game. As we’ve said, IGT has a track record with Chinese themed culture slots. They have produced many of the years, and most of them we would rather care to forget. Those unmemorable slots will become more unmemorable thanks to the release of this game, though. IGT have broken from tradition and allowed you a reasonable degree of flexibility when it comes to adjusting paylines and wagers, and they have gone above and beyond when it comes to their free spins bonus. Hopefully, the 1421: Voyages of Zheng He slots represents something new, a potential direction that IGT should follow when they develop other new slots in the future. You will quickly find that this slot has a thematic menu bar, and it has been designed in the shape of a boat. This menu can see you alter any of the 88 paylines which appear on this slot’s 5 reels. You will also be able to alter the value of your coins. Using the menu buttons given to you, you can find yourself wagering anything from a floor bet of just $0.08 per spin, up to a ceiling bet which is capped at $880 per spin. That’s not a bad wagering range for any IGT developed slot, really, and it is one which enables most players a decent run in the game, no matter what budget they are playing with. Wild symbols: Although the 1421: Voyages of Zheng He slot does try to shy away from some of the most stereotypical symbols in the Chinese slot genre, it does contain a golden coin. This symbol acts as a wild icon, and it can substitute for all other symbols in the game, barring scatter symbols. Scatter icons: Those scatter symbols can offer you 2x your total bet when 3 or more of them appear in any positions on the screen at any one time. Three or more of these picturesque symbols will also trigger a Players Choice bonus when they land on the reels of the game. Players Choice bonus: Once the bonus has been activated, players will have a choice to make, as the title of this feature suggests. On the one hand, they could choose from three free spin features, which we will come to in just a moment. On the other, they could opt to play an instant win game. The latter features three cups, and underneath one is a golden ball. It is your job to find out which cup the golden ball is underneath. Guessing correctly can see you win up to 102x your total bet. Free spin bonuses: Should you opt for the free spin bonus, you will have three possible bonuses to choose from. One option can see you able to play with 20 free spins. You will have a multiplier which ranges from 1x up to 3x in total, though. Another option could see you play with 15 free games, but multipliers are then limited from 1x up to 5x in all. Lastly, why not choose the 10-free spin option. This promises multipliers which range from 1x up to 8x in total. 1421: Voyages of Zheng He comes with a theoretical RTP (return to player) rate of between 92.10% and 96.04%. That might not be the best news you’ve ever heard, but it is at last fair in terms of how much a spin costs. Players can expect to be able to win as much as 888 coins in this game. You need to line up 5 golden coin wilds on a payline to bag that prize. 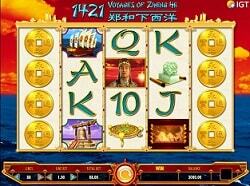 1421: Voyages of Zheng He is a nicely themed, nicely designed, and nicely structured video slot. IGT have done a few new things with this game (multiple spin bonuses, instant win games, and plenty of betting options), and they must be praised for that. The 1421: Voyages of Zheng He slot really is a game that most players will be able to get on board with.